This exciting project brings together decades of study about mythology with one seeker’s circuambulation through the landscape of Ireland, all described with a poet’s voice. Pat Monaghan has studied and taught many integrated studies in poetry, science, mythology, feminist spirituality, environmental studies, chaos theory, and religion. All of these disciplines inform her writing, but none distract from the poetic story-telling or the mystical lore she encounters and then conveys. Her journey takes her to a churchyard with a fountain representing St. Bridget, perhaps a Christian representation of the Celtic goddess of water, fire, and transformation, called Brigit. 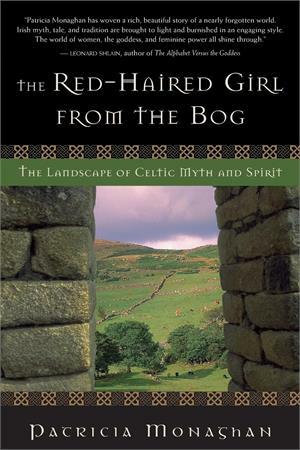 Monaghan describes spiral petroglyphs and ancient sacred caves, bogs and woods where fairies have played their tricks on humans, and water falls that became sacred spots. The stories instruct and teach, as Monaghan points to ways that these myths still reveal the truths of human life, and the contradictions of love and hate, mother and seductress, harmony and struggle that are embodied in women’s lives — in all of human existence.